Seems like ants are everywhere, right? They are! Ants and termites, along with thier close relatives bees and wasps, make up fully 3/4s of the total insect biomass. In fact, ants and termites make up about ⅓ of the Amazon’s dry land biomass. Ever wonder what an ant’s nest looks like? Here’s one after it was filled with plaster, and then scientists picked away all the surrounding dirt. Reasearchers investigated another much larger, but by no means special, nest and found that the structure was over 26 feet deep and horizontally covered over five hundred square feet. 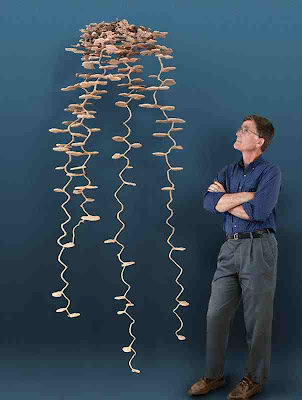 To build it, the colony moved 40 tons of dirt—billions of ant loads, each one weighing about four times as much as the worker ant that carried it. In human terms, the dirt was carried over 1/2 mile to the surface. Ants are resistant to hard radiation. While plants died around them, ants exposed to intense cesium irradiation suffered no apparent harm nor change in behavior.